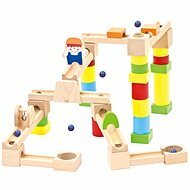 The Marble Run Super ball track play set allows each small builder to create his own ball track and enjoy hours of great entertainment. Build the model according to the enclosed instructions or create your own design. The package includes the slides, bridges, pillars and paddle wheels. Therefore everyone has an almost endless variety of possibilities to enjoy the time spent by creative gaming. This play set is recommended for all children aged from 4 years. 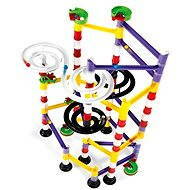 For shipping to other EU countries visit this page Ball Track - Marble Run Super. Für Versand nach Deutschland, besuchen Sie bitte Kugelbahn - Marble Run Super. Chcete doručit zboží do Česka? Prohlédněte si Kuličková dráha - Marble Run Super. Chcete doručiť tovar na Slovensko? Prezrite si Gulôčková dráha - Marble Run Super. Für Versand nach Österreich, besuchen Sie bitte Kugelbahn - Marble Run Super. Magyarországra történő kiszállításért tekintse meg ezt a termékoldalt: Golyópálya - Marble Run Super.